MyBinding is proud to offer high quality badge holders for all of your identification needs. We carry a wide range of clear vinyl, anti-print transfer, recycled, reflective frame, colored, anti-static, rigid, secure shielded, multi-card wallet, dispensers, and badge holders for any and all of your visual identification needs. Nearly all of the holders we carry at MyBinding are available in a variety of sizes including credit card, business card, military, name tag, large, and extra large sizes to fit whatever size ID you need. Available in vertical and horizontal styles to properly fit your visual identification, MyBinding.com is your best option for all of your identification needs. Welcome to MyBinding video. 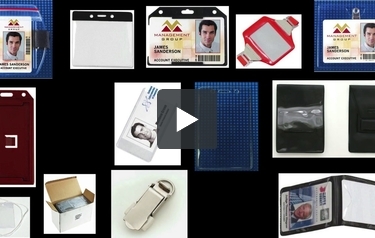 We have the guaranteed lowest prices on a huge selection of badge holders. MyBinding.com is proud to offer high-quality badge holders for all of your identification needs. We carry a wide range of clear vinyl, anti-print transfer, recycled, reflective frame, colored, anti-static, rigid, secure shield and multi-card wallets. Basically, we have dispensers and badge holders for any and all of your visual identification needs. And sizes of our pouches go from business and credit card all the way up to large and extra-large sizes. With colors, styles and options in vertical or horizontal positioning, we have what you need. Give us a call or a click, we’re here. When image matters, MyBinding.